This morning we arrived at the ZAD. We will start our on the ground today. If you want to contribute to our live blog; You can send your pictures, videos, reports and analysis. Go to our submit page: here. Click at the refresh button of your browser to get the latest information. 07:56pm Nantes: There are still people on the move. 7:24pm Small fires burning in Nantes. O7:10pm Situation unclear at the moment the cops attacked us with tear gas and after that we were on the other side of the Blockade. 06:41pm Cops are still firing tear gas in Nantes. 06:27pm We hope you don’t need it but this is the number of the legal team in Nantes: 0675309545. 05:31pm Clashes in Nantes now. 05:27pm The cops fired tear gas in the front of the #ZAD #NDDL demo in Nantes. 05:11pm The demo in solidarity with ZAD is big! 05:00pm Nantes: Demo in Solidarity with ZAD is starting to march. Cops have a helicopter in the air now. 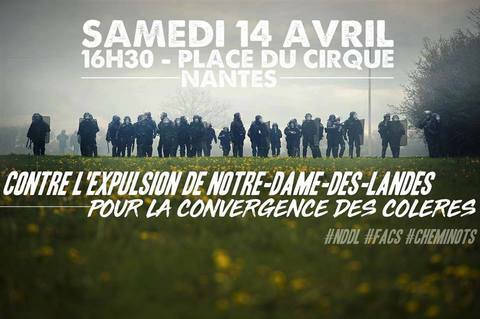 04:48pm The first demo arrived at place du cirque in Nantes where the ZAD demo will start. 04:26pm Riot cops guarding the prefecture in Nantes. The demo of striking sncf railway workers arrived there. 04:05pm Demo stopped again but after 15 minutes the demo started to march again. 03:32pm Demo is marching again. We were forced to turn left. 03:19pm The demo is growing but is now standing still in front of a water canon and cops. 03:07pm Demo of striking SNCF workers started marching. Several 1000 people take the streets in Nantes for the first Demo. At 04:30pm the ZAD Demo will start. 02:41pm Watch out for Civil cops operating in groups. They check people near to the starting point of the demo and are on the move and take black jackets etc without protocol or anything… Which is of course not allowed but they do it anyway. 01:44pm. Many many cops already in the city center of Nantes. Water canons etc. The full program.